As the Affordable Care Act (ACA) has become less “Obamacare” and more in danger of disappearing, it has become more popular. As Barack Obama’s ownership of it fades with his retirement, the “care” part of the act has become more valuable. Its value is highlighted as congressional Republicans are struggling for a replacement. The political risk is unavoidable when hundreds of citizens and activists show up at town meetings warning of the consequences of repeal leaving large numbers of people with inadequate or no health insurance. 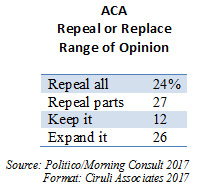 The number of persons wanting to repeal the law in its entirety in this poll was only 24 percent, with an equal number, 26 percent, wanting to expand it. Twelve percent want to keep it as is. 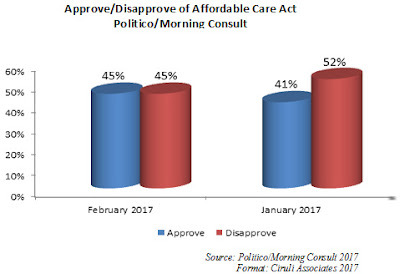 The balance of power with 27 percent was those who just want to repeal parts of it. Steve Bannon, President Trump’s foreign policy strategist, has set his goal to help bring a conservative nationalist revolt throughout the developed world. He applauded, as did his boss, Brexit, and his rhetorical flourishes in the inaugural address were hailed by most of Europe’s anti-immigrant, anti-EU nationalist parties. But, his strategy is also producing a left-wing counter-reaction. Mexico’s next government may be on the left (Andrés Manuel López Obrador) and a German socialist is taking on the center-right party of Angela Merkel by attacking Donald Trump’s and Bannon’s America First rhetoric (Martin Schutz). An anti-Trump, center-left independent in France also has surged in recent days (Emmanuel Macron), as attacking Trump has become a survival strategy of pro-EU liberal forces in Europe and the left generally. 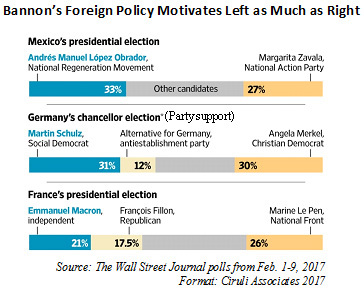 Trump and Bannon are stimulating movement of European and Mexican politics at least as much on the left as the right. Trump is not the first president to start campaigning early. The permanent campaign as a term was first used in the Carter administration and certainly Reagan, Clinton and Obama made considerable use of the White House and presidential resources to prepare for re-election and try to build legislative support. But to announce it after only four weeks, partially as a reboot and an escape from the “swamp” of Washington, is unusual. He needed to recharge while escaping the troubles of D.C. Starting the campaign early also has to do with Trump’s insecurity over his legitimacy. He lost the popular vote in a narrow Electoral College win. From the size of his inaugural crowd, to 3 to 5 million illegal voters, to the denial of Russian involvement, Trump spends immense amounts of mental energy on shoring up the authenticity of his election. Nothing will treat this insecurity as effectively as winning a popular and Electoral College victory in 2020. Out of more than 136 million votes cast, Donald Trump won the Electoral College (304 to 227, or 77 votes), with a margin of 78,000 votes in three states: Pennsylvania (44,000) (20 electors), Wisconsin (23,000) (10) and Michigan (11,000) (16). But, he was the fifth president to win the electoral vote and not the popular vote. Two elections took place November 8. 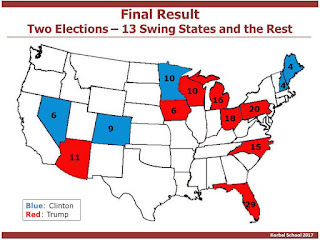 Trump won 13 swing states as computed by Charlie Cook on his website by about 800,000 votes (Trump won 8 and Clinton won 5). But, he lost the popular vote in the remaining 37 states and D.C. by 3.7 million votes, leaving him behind by 2.9 million. U.S. presidential politics is a blend of votes and geography. Much of Clinton’s advantage came from a handful of states and large cities. Greater Los Angeles, New York, Chicago, D.C., and Atlanta delivered overflow votes. But, Democrats’ urban strength did not make up for the Trump solidarity in the white working class and voters in small towns and rural areas. Philadelphia, Atlanta and Miami did not deliver Pennsylvania, Georgia or Florida. Democrats swept California by 61 percent, or more than 4 million votes. But their overflow voters in California was superfluous. The significant concentration of the Democrats in a handful of states led to the Electoral College failure and contributes to their weak position in the House of Representatives. 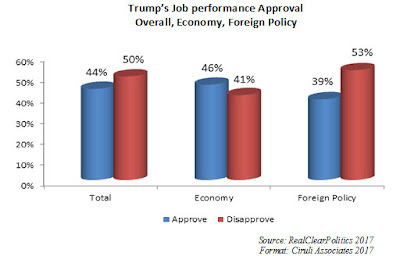 RealClearPolitics keeps a running average of presidential approval, and as well reported, Donald Trump has a net negative rating and record-low approval (44% approve to 50% disapprove). The polling website also tracks presidential approval on economic and foreign policy performances. Although Trump’s economic performance approval isn’t particularly high, his negative rating is a low 41 percent. Not surprising, on foreign policy his approval is only 39 percent and disapproval is a high 53 percent. It is foreign policy with the roll-out of the refugee ban, the war of words with Mexico over the wall and paying for it, and sacking General Flynn that has produced the most negative headlines. Even with his well-regarded cabinet appointments at state and defense, there appears to be a divergence in policy with Trump on the EU, NATO, Russia and Iraq oil. Foreign policy was also the area that garnered the most resistance during the campaign from the establishment of both parties. And, it’s the area Trump is seen as the least experienced and most ill-suited in terms of temperament, with several highly opinioned unorthodox advisors (Bannon, Miller, Flynn, Gorka). Trump has the jobs message down. It is foreign policy where his message sounds mostly confused and risky. Democrats’ weaknesses in the interior of the country will be on full display in the 2018 election. 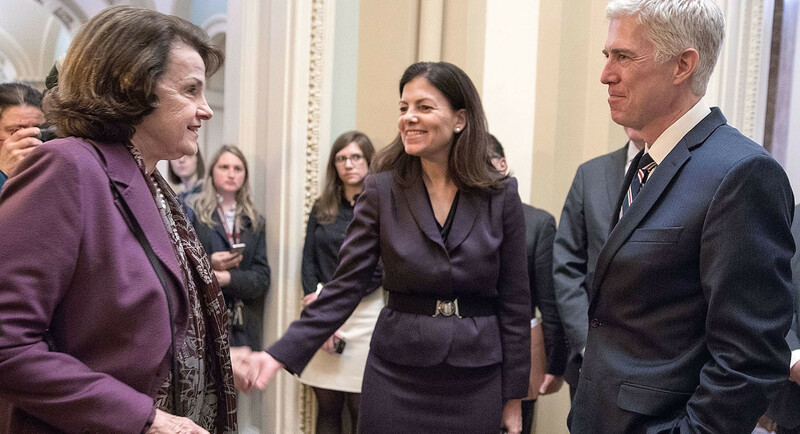 They would like to pick up the three senate seats they missed in 2018 (would have needed 2 if Clinton/Keane had won) to control the Senate. But out of the 33 seats up, they must defend 25 (including their 2 independents) and many are in the heartland where Donald Trump did well. Republicans have only one seat out of 8 in a state Hillary Clinton won – Nevada and Democrats will target it. Democrats will also challenge Jeff Flake, who only won with 49 percent in the 2012 race, but it will still be difficult for them to win Arizona (Trump carried it by 4 points). They will likely take on Ted Cruz in Texas, another difficult win, but they hope he’s vulnerable with his endless shifting position on Trump and changes in the state’s demographics. But Republican opportunities are huge. 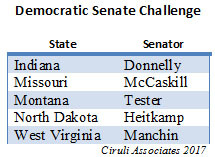 Democrats will be defending highly vulnerable seats won in President Obama’s 2012 re-election. Five of those states were carried by Mitt Romney that year. Last year, Donald Trump won them and the Republicans will target them. 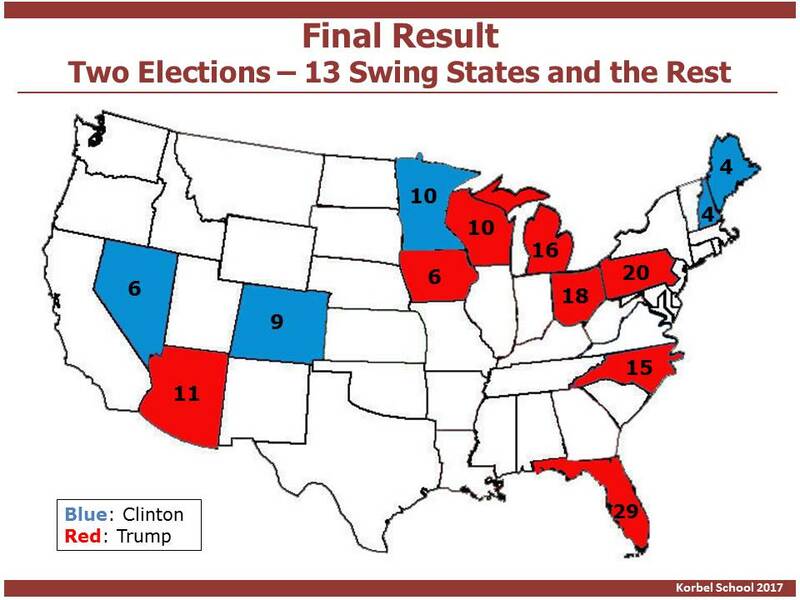 Also, a few states Trump won (but not Romney) will be put on the target list, including Florida (Nelson), Ohio (Brown), Pennsylvania (Casey), Wisconsin (Baldwin) and Michigan (Stabenow). Obviously, Trump’s popularity will be a factor, but if he holds his base and most Republicans, Democrats will be playing more defense than offense in these senate seats. 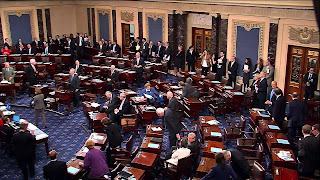 The Democratic Party’s Beltway leadership and messaging has not been appealing to a majority of voters in the states with vulnerable senators. Will the Democrats move off the coasts and out of the big cities to challenge Republicans with the working class voters in rural areas and smaller towns or lose these senators? A new poll reaffirms what conversations from Wall Street to main streets, Capitol Hill to state capitols repeat: Even if you like some of Donald Trump’s policies and cabinet picks, the White House is a chaotic mess. The Flynn resignation is just the most dramatic incident in three out-of-control weeks. 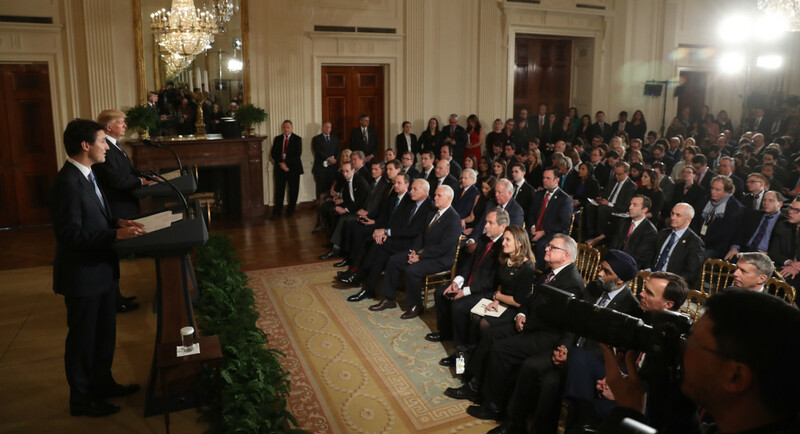 But the selection of Neil Gorsuch Tuesday, February 1, was a calm moment in a sea of turmoil, which most Republicans would like to see repeated and polling seems to agree. 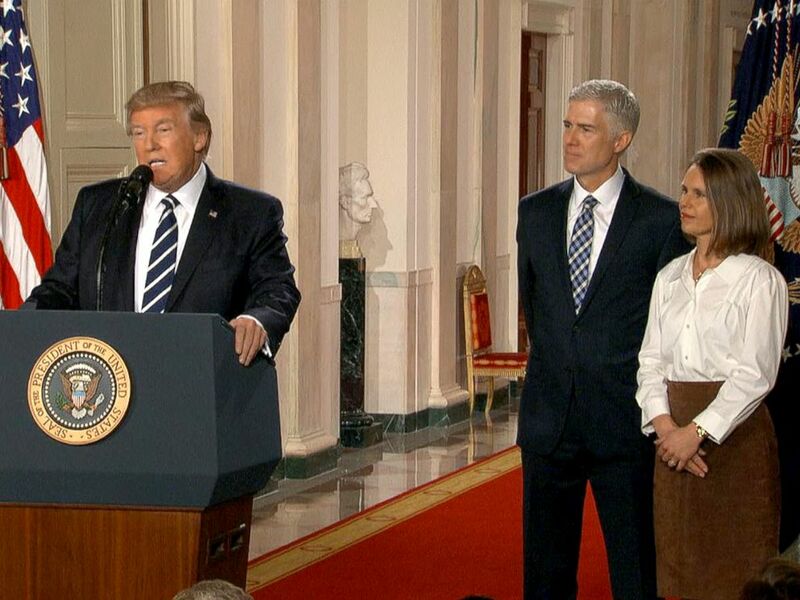 Gorsuch has a 51 percent approval in a new national poll (Feb. 3-36, 2017) with 39 percent disapproving. The latest Gallup poll has President Trump at 40 percent approval and 55 percent disapproval, a drop in Gallup numbers over the three weeks of 15 points. Michael Flynn was enjoying the company of his White House colleagues on the day of his resignation. All appears well at the 2:00 pm press conference between President Trump and Prime Minister Trudeau. Flynn sits in the front row with Vice President Pence, Reince Priebus, Jared Kushner, Stephen Miller, Steve Bannon and Kellyanne Conway. 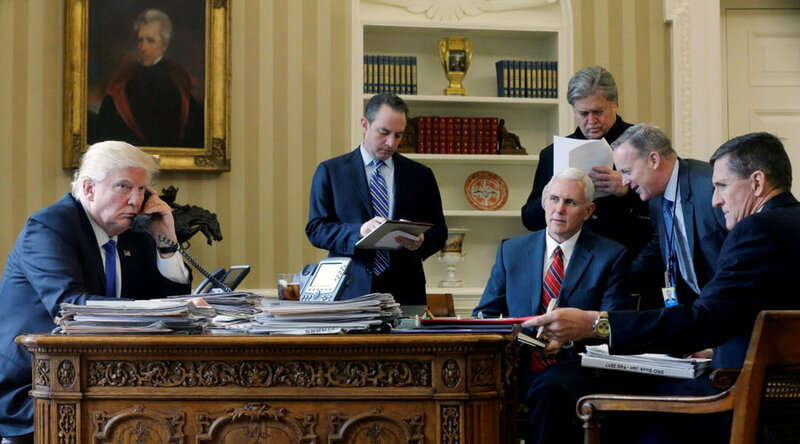 The picture changes rapidly when at approximately 4:00 pm Conway reports Flynn has the President’s “full confidence” after questions that the Justice Department had warned the White House on January 19 that Flynn’s December 29 Russian conversation was a problem and the FBI had an ongoing probe. Shortly afterward, Sean Spicer contradicts Conway and announces Trump was “evaluating the situation.” By 11:00 pm, Flynn is out. 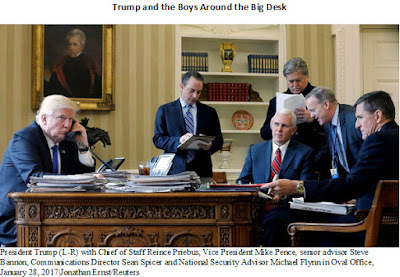 The 24-day White House career of General Flynn, soared from being a key participant on January 28 in the high-back chair in front of the Resolute Desk as President Trump talks to President Vladimir Putin to February 13 when he lost his desk. Washington is a tough town. On a variety of scales, Colorado remains a competitive two-party state. For example, Gallup records Colorado as competitive in its 2016 fifty-state ranking of partisan affiliation. Nationally, partisanship is 47 percent Democrat and 42 percent Republican, or a five-point Democratic advantage. Colorado is cited as competitive with a less than one percent advantage for Republicans. Fourteen states are listed competitive, including Arizona, Nevada, Georgia and Virginia. In terms of liberal and conservative ideology, Colorado is considered centrist in a fifty-state list, with 35 percent stating they’re conservative, 36 percent moderate and 26 percent liberal. But, it is on the more liberal end of the scale and the scale has moved to the left in recent years. Colorado’s position is confirmed by the shift in attitudes during the last decade toward legalized marijuana, which was defeated as a ballot proposal in 2006 by 59 percent and approved in 2012 by 55 percent. Also, a civil union initiative was defeated in 2006 by 53 percent, but passed by the state legislature in 2013, and polls showed it had 71 percent of Coloradans’ support (Quinnipiac 2013). 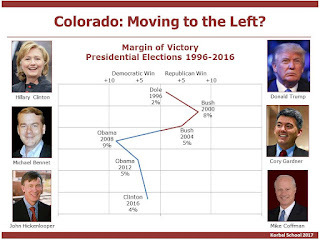 Although Colorado remains competitive between the two parties, as shown by candidates representing the two parties winning statewide races and splitting control of the state legislature, in fact, the state has moved at least two points to the Democratic side of the scale since 2006. This is most clearly shown in terms of registration and voter behavior in presidential elections. Republicans have lost their registration advantage. Voters not affiliated with a party are now the largest political group in the state, and polling shows they skew younger and somewhat more liberal and Democratic. 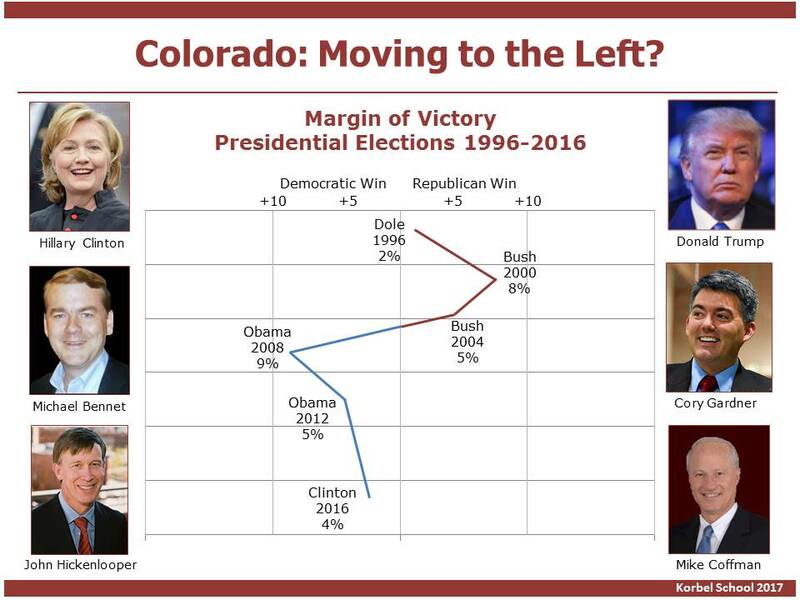 Viewing the presidential races since 1996 shows Colorado shifted to the Democratic side with Barack Obama’s first election and remained in that camp through the 2016 Clinton election. The next major political race in Colorado is for governor. The ebb and flow of Washington politics and the quality of local candidates will frame the race. And although Republicans could win it, at least the early numbers suggest Democrats have a slight advantage. 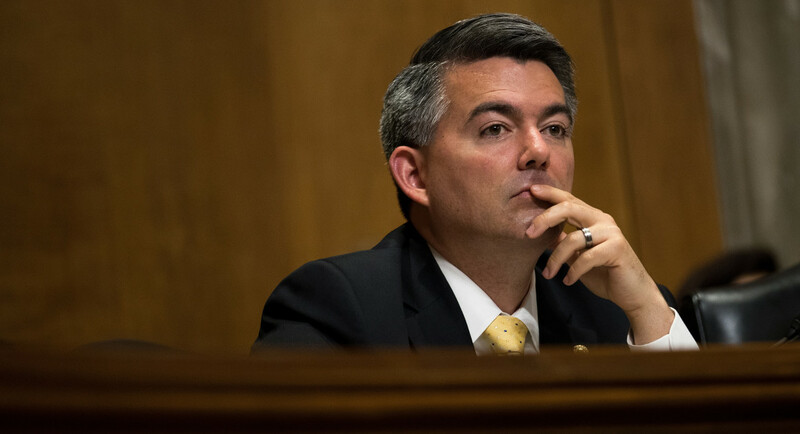 Politico reports that Colorado’s Senator Cory Gardner organized a letter to President Donald Trump opposing weakening the U.S. position on sanctions against Russia. 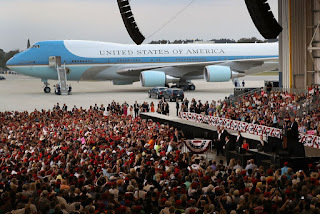 He was joined by eight fellow Republicans, including John Cornyn of Texas, Jim Inhofe of Oklahoma, Joni Ernst of Iowa, Lindsey Graham of South Carolina and Rob Portman of Ohio. The blowback from Republicans was triggered by Trump’s statement of moral equivalency between Vladimir Putin and the U.S. Republican leadership disagreed, including the Majority Leader Mitch McConnell who called Putin a thug, Foreign Relations Committee Chair Bob Corker who proposed sanction legislation, and Committee member Senator Marco Rubio who asked new Secretary of State Tillerson if given the evidence of bad behavior, Putin could be classified as a war criminal. Gardner is on the Foreign Relations Committee and building a reputation for expertise and a willingness to speak out. The politics of Gardner’s criticism of Trump is tricky. Left-wing protestors dog his visits (the resistance), Trump supporters feel he’s being disloyal and establishment Republicans worry about the state’s clout with the administration. But Gardner’s positioning appears to have served him well. He has very conservative principles (High Plains Tea Party-type), he is part of the leadership (establishment credentials) and he strikes out with some independent positions (skepticism on Trump’s Russian policy). So far, it’s worked. Donald Trump glided into his first week in office from a poorly rated transition into a record low approval, which continued three weeks into the job. 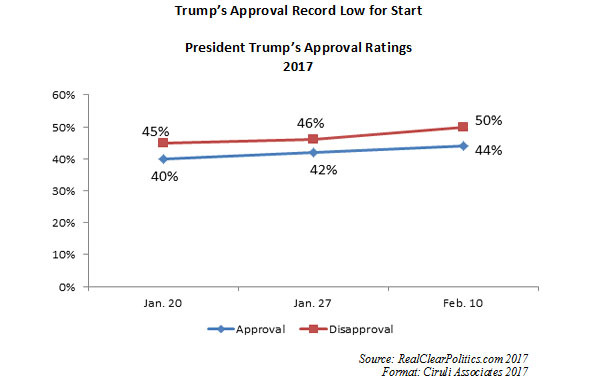 RealClearPolitics started his average with a couple of polls on January 23 at 40 percent approval to 45 percent disapproval. 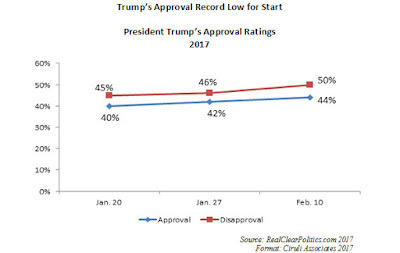 After three weeks, both numbers have increased, and on February 10 he had 44 percent approval to 50 percent disapproval. Gallup, which tied Trump at 45 percent for both approval and disapproval in their first poll posted on January 23, pointed out that he is the first president since polling began tracking approval in 1953 (Eisenhower) to be below 50 percent. However, Gallup points out that Trump has his supporters, especially among whites (56% approve), 65 years and older (53%) and Republicans (90%). Gallup numbers have gotten significantly more negative as the administration has progressed. Trump has lost 15 points in three weeks. Gallup now records 55 percent disapprove (10 points down from 45%) and only 40 percent approve (5 points down from 45%). He will govern as he was elected as a plurality president in a polarized era of low trust for most institutions. Trump is incredibly sensitive to audience data, including crowd size, polls and approval ratings. He receives it, reviews it, picks what he likes and claims what he doesn’t like is rigged. First impressions are important. Neil Gorsuch’s education, legal career and reaction from the early round of Senate interviews appears to bode well for him getting at least 60 votes, which cuts off a filibuster. 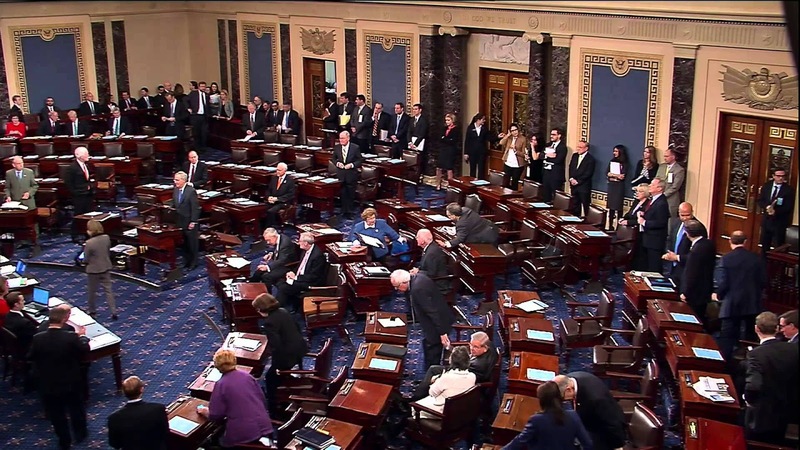 Typically, from nomination to Senate confirmation is about three months. Hence, by April this nomination should be ready for a vote. Hearings tend to take 4 to 5 days. Justice Scalia had two days of hearings, but Alito had five and Roberts four. Obviously, some issue could arise over the next several months of investigation, interviews and hearings to derail the nomination, but as of now, he appears to fit into mainstream on the conservative/libertarian side of court. But, the Democratic Party could continue toward its strategy of total resistance and drag its Senate members with it. 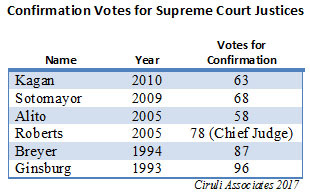 Nearly all of President Obama’s, Bush’s and Clinton’s judges got more than 60 votes for confirmation. Justice Alito received 58 votes (60 votes needed to proceed to confirmation under current rules, simple majority to be confirmed). Justice Thomas received only 52 votes after his difficult 11 days of hearings in 1991. The only defeat in recent years was Justice Bork in 1987, who received only 42 votes. President Bush had to withdraw a nominee, Harriet Miers, in 2005 and, of course, Merrick Garland did not get a hearing in 2016. 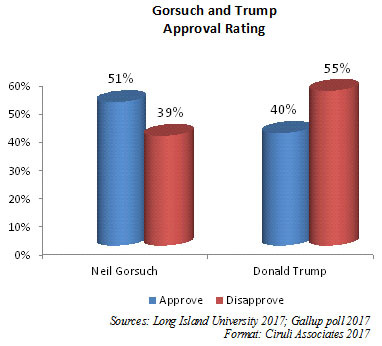 Judge Gorsuch could have a very long term on the Court. Scalia was 50 years old when he entered the Court and 79 at the time of his death last year. Gorsuch is 49 years old and could serve for three decades if he follows in the average age of retirement in recent years, which is 79 years old. As a highly qualified appeals court judge and Colorado native, Senator Michael Bennet will be hard-pressed to not join his colleague, Cory Gardner, and vote to consider and vote to confirm. Early polling shows Gorsuch’s nomination by Trump receiving a 50 percent approval, and most importantly, two-thirds (65%) of the public believe “Senate Democrats should allow a vote on the nomination.” Hence, although Democrats are angry about Judge Garland not getting a hearing, it’s been more than a year without a justice and more delay will become a potent argument to get the process done. Will Germany Have a New Chancellor? German parliamentary elections on September 28 will either renew Angela Merkel’s 11-year chancellorship or put Martin Schulz and his left-green coalition in the chancellery. 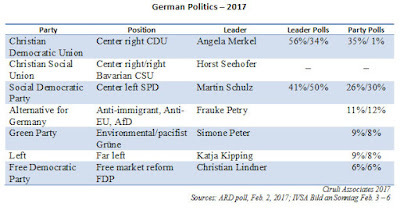 Merkel remains the frontrunner to put a governing coalition together, but the entry of Schulz as head of the Social Democrat Party (SPD), the second largest in Germany and part of the current ruling coalition, makes the election much more competitive. 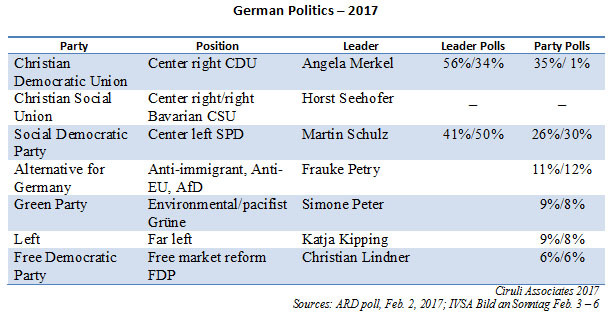 The latest polls show that, in terms of personal popularity, Schulz matches Merkel. Her advantages has been that her party, Christian Democratic Union (CDU), would receive a third of the parliamentary vote, and hence, be the largest bloc, a superior position to form a new government. But polls in the last few days show the two parties equal. Both candidates support the EU and German membership, as does the public and elite opinion. But the super government in Brussels has taken two shocks with Brexit and the election of Donald Trump. On April 23, a Eurosceptic could win the French presidential election, which could be a fatal blow to the European experiment. But the entire year will likely see hostile campaigns and references about the EU from elections in the Netherlands and possibly Italy and regularly from Trump. Merkel’s problems include some general disapproval of her handling of the refugee crises, the rise of a farther right party, AfD, which has won some local elections and Schulz’s high- profile attacks on Trump, which is uniting the left and attracting some in the disaffected center. Germany has greatly benefitted from the post-war era of a peaceful, unified Europe. It now dominates the continent’s markets and has little military cost due to the NATO alliance. But its center parties are still in some stress. They have shown weakness in recent state parliamentary elections and the political landscape has fragmented. Despite Germany’s main party’s commitment to Europe, questions abound. Will another Eurosceptic party take over an EU country in 2017? Will the EU still be viable by the September election? Will Trump continue to criticize the EU and NATO? In general, can Merkel and the German center continue to benefit from the EU, or is the new nationalism in control? On Saturday, January 28, Jonathan Ernst of Reuters captured the Trump team dealing with their first of many crises – the travel ban against seven countries. It was a busy weekend dealing with an issue that has now taken over the administration’s media coverage. Everyday there is a new photo op and a new battle to get in the picture. Priebus likes the far left position behind the boss and Bannon the far right. Typically, Conway and Kushner fill it. Even Donald Trump is nervous about the seeming chaos and has given Priebus more authority. Will it hold against the agendas of Trump’s team – dismantle the conventional governing norms, challenge the American and global establishment, and create a new nationalist alignment of global politics? The Week: Is Reince Priebus back in Trump’s good graces? WorldDenver hosted seven international leaders January 23 who had just attended President Trump’s inaugural and were anxious to discuss the implications for American politics and the impact on their countries. I presented a talk on the attraction of populism and its anti-establishment themes for Western Democracy. The Western European representatives were very aware of it (Poland and France were represented). But populism, in their view, is a worldwide political phenomenon. 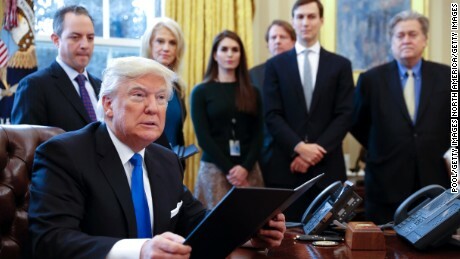 The first seven days into Donald Trump’s presidency were a whirlwind of activity. By last Friday before 4:00 pm and his poorly executed immigration order, he had introduced 13 executive actions. 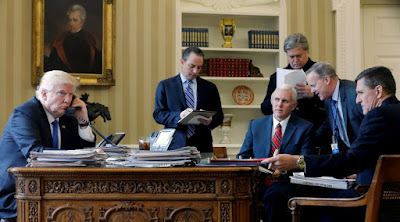 Each signing in the Oval Office at a clear and polished desk produced drama and attracted the undivided attention of the national and regional media. 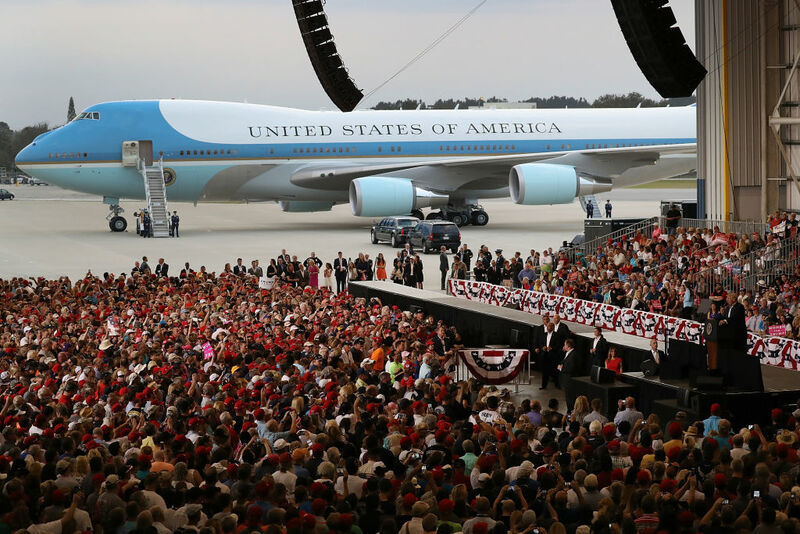 It was smooth sailing until Friday evening with Trump effectively arguing that he was fulfilling his campaign promises and that people had no patience for the slow pace and lack of action in Washington. Although some of the actions rapidly produced resistance, such as changing Obamacare operations, dropping out of the Trans-Pacific Partnership, and the opening salvo on the wall and who would pay for it with Mexico, Republicans stayed with him. It wasn’t until Friday evening that the shock and awe of the first seven days turned into a full-scale resistance after the immigration order. But, the White House team appears to be savoring it all. In the first round of the French Presidential race on April 23, candidates claiming to shake up the political establishment from the far right to the far left dominate the field. Even the two main parties, the Socialist and Republican (right), rejected candidates associated with center and status quo views and chose outsiders with very conservative or very liberal views. The top two candidates on April 23, assuming one of them doesn’t receive half the vote, will compete in a run off on May 7. A new poll published February 1st shows the independent Emmanuel Macron ahead of François Fillon, the conservative frontrunner due to a late breaking scandal involving payments to Fillon’s wife. In recent elections, French polls have tended to capture the party and candidate alignments with reasonable accuracy, but the environment is more fluid today with more independent candidates, some of whom are just becoming nationally known. Also, the populist, nationalist surge reflected in Brexit and Donald Trump’s victory is a wildcard in the race. After eleven days of near chaos caused by President Trump’s controversial and poorly executed executive actions, he finally makes a choice the establishment base of the party and corporate community can support. And, he announced it without the usual self-aggrandizement (although he did manage a few superlatives). Since last Friday’s midnight order on immigration, which unleashed the airport resistance, bad headlines and chaotic weekend TV coverage, the White House has been on the defensive and its neo-nationalist wing receiving in-depth, mostly negative, coverage. Trump knew it was time to change the narrative and moved up the Supreme Court pick by two days. 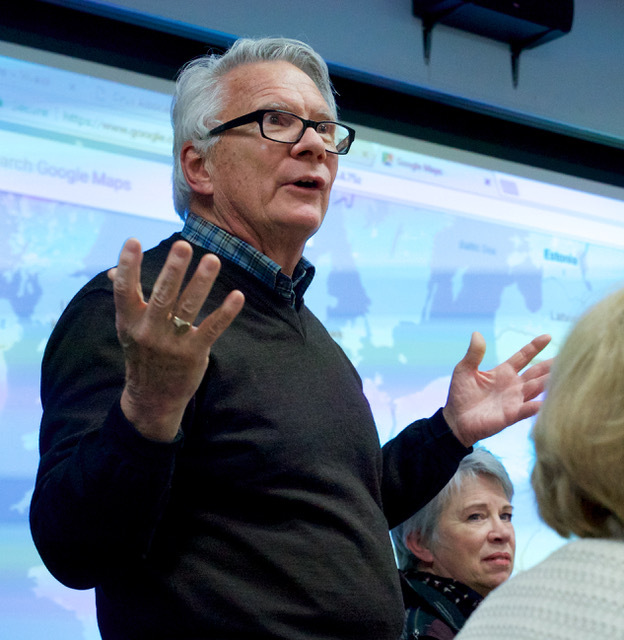 Post-truth and fake news were the topics at a Colorado Water Congress panel with Vincent Carroll and Joey Bunch. 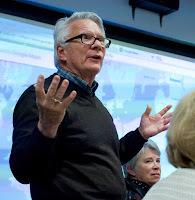 Carroll is the former editorial page editor of both the Denver Post and Rocky Mountain News and still writes guest editorials for the Perspective section of the Sunday Post. Bunch, former Post reporter, is now with the Colorado Springs Gazette’s statewide political blog, Colorado Politics. Bunch pointed out that dealing with a polarized news environment and fake news requires the news consumer to be more purposeful than in the past and roam across news sites and the political spectrums. It takes more effort to ensure the reported news is truly of the significance and has the meaning that’s been attached to it. 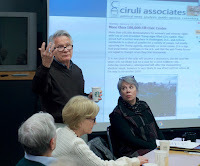 Carroll believes that national news organizations will continue to be healthy and Washington D.C. rich with a full range of opinion. But, he lamented the reduction from 500 to 100 working reporters for regional news in Denver. It has been a loss that reduces the coverage of local government and investigative news. He also made the observation that, to some extent, Donald Trump became president because he violated the news norms of politics. He was unscripted, unconventional and unmanaged. Many people like his politically incorrect banter with the media. I observed fights between Trump and the media that broke out at various times during the campaign have since the inaugural become a full fledge battle. The President regularly calls reporters “the most dishonest people in the world” and labels new reports and news agencies he doesn’t like “fake news.” And major news outlets daily label the President’s statements as false and without evidence. This war will not diminish. Trump loves coverage and believes he needs to tweet to bypass the “dishonest press.” Much of the country’s press establishment believe he is unfit for the office or is enacting not just bad, but dangerous policies. They are going to stay on the beat. And both are going to stay in the fight.